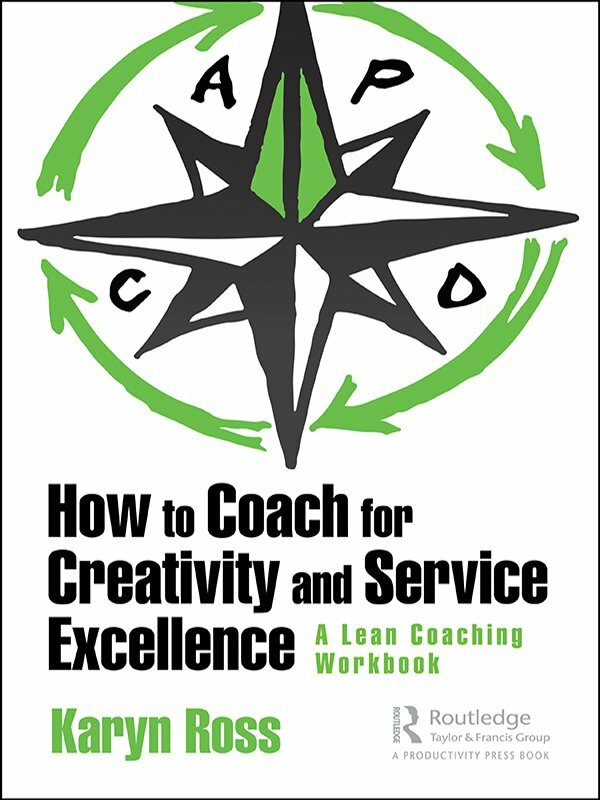 How to Coach for Creativity and Service Excellence: A Lean Coaching Workbook is a self-contained workbook, in which the reader completes twenty-one days of practical exercises and activities focused on creativity, lean and coaching (one set per day). This will enable the reader to develop their capability and confidence to be creative, adapt lean principles, practices and tools to their unique service organization and coach others to do the same. The workbook guides the reader through a structured, systematic, easy-to-understand, habit-building approach, and function as the reader’s ‘coach’. As the reader ‘works’ their way through the book, they will reclaim their creativity, learn Karyn’s tried-and-true 15-minute a day coaching approach and adapt lean principles, practices and tools to their particular service organization. • Learn by ‘doing’. Changing what we do – and seeing the different result - changes how we think, not the opposite! • Adapt lean in a way that makes sense for their service organization. Lean practitioners working in service organizations may have difficulty adapting lean manufacturing practices to meet the special ‘people’ considerations found in services. • Practice continuously to make a habit. Coaching helps people develop the discipline and stamina needed to turn new behaviors into habits. That’s the beauty of this book! It functions as the reader’s personal ‘coach’, guiding them through the daily practice required to make new behaviors (and the resulting new thinking) a habit, so that they can coach their organization to success! Part 1: Introduction: It takes 21 Days To Make a Habit! Time to Get Started! Part 2: Time to Practice! Day 3: A Vision Gives Us Something to Strive Towards Together! Day 8: Do You REALLY Know What’s Going On? Day 9: The Importance of ‘Making It Visible’: Both Process and Mindsets! Day 10: The Importance of ‘Making it Visible’: Minding the Gap! Day 20: Time to Reflect! Part 3: Conclusion: Where am I - and my learner - now? What’s Next? Day 21: What Did We Learn?